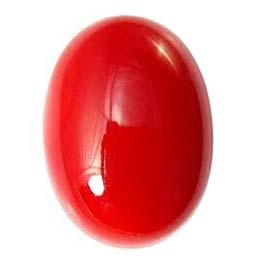 Red coral is the hard stony skeleton of a Mediterranean coral that has a delicate red or pink color and is used for jewelry The color is uniform throughout.Â Polished coral has a vitreous luster.Â Â Now a days it is an endangered species due to pollution. One must removed this gem at night. It is recommended for brides. It is believed to different disease. You can order this precious stone. For children recomended ratti 2 to 3, for minor 3 to 6 ratti and for adults 5 to 21 ratti. Ring should be made of only Gold, Silver or Copper. Ring should be worn only on Tuesday Morning and Ring should be worn in Anamica to Tarjani finger.